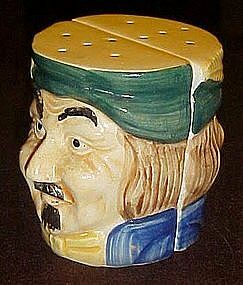 Large od toby face salt and pepper shakers fit flat back to back. Same face on each, and they measure 3 1/4" tall. Original old corks. No chips or breaks or cracks. Gentle crazing which is normal. Hand painted and glazed. Some minor staining on the bottom underside.